Cost is often an important consideration in the privatization decision, and officials should be aware of the true cost of both in-house and contracted services. Computing the cost of service delivery is a complex accounting endeavor, and there is no "cookbook" method that will eliminate all subjective evaluations. The guidelines presented in this paper, however, present accepted practices that will help ensure that all relevant costs are considered. Once costs are computed, how should they be used in evaluating whether or not to privatize? Depending on the information sought, different sets of costs should be considered. These are appropriate in assessing the cost of contracted service, and should include contract administration and monitoring. These costs are appropriate in evaluating the operating efficiency of a public provider. Comparing the fully allocated cost of the in-house provider with the anticipated total cost of contracting is useful in assessing their relative efficiency. If the fully allocated costs of the public provider are more than ten percent greater than for a private contractor, that service merits further consideration for privatization. Fully allocated costs, however, are not the correct measure for estimating the likely cost savings through privatization, as fully allocated costs tend to overestimate savings, especially in the short term. These should be used to estimate cost savings. Comparing the avoidable in-house costs with the total cost of contracted services provides the best assessment of the likely cost savings achievable through privatization. 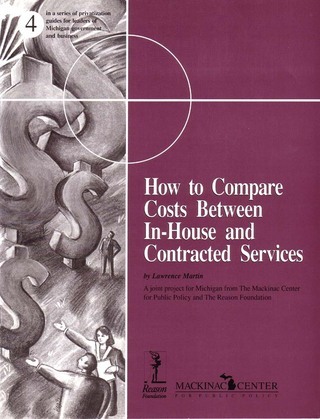 Precisely which costs are considered varies with the time given the government provider to reallocate resources. Some costs that will not be avoidable in the first year will be avoidable three or five years later. In the short term, avoidable costs may be close to marginal costs. In many cases, in the long term, avoidable costs should approach fully allocated costs. Whether a particular cost is avoidable or not also depends on the determination of the public entity to reallocate resources in order to hold down costs. Furthermore, a cost may or may not be avoidable depending on the extent of the privatization and legal constraints on the public provider. When the privatization in question concerns a new or expanded function, fully allocated in-house costs should be compared to expected total contract costs.